For holiday, I decided to whiten my teeth. I've posted before about loving Crest White Strips, but they're getting harder and harder to get hold of in the UK. I decided to try out a cheap-ish kit from Boots. 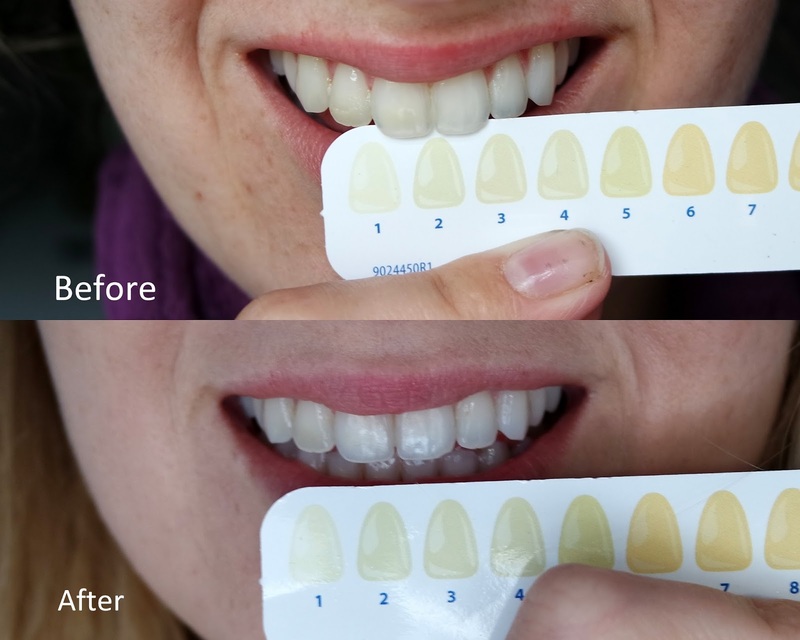 This is the Rapidwhite 2 week tooth whitening system and costs £20. The kit comes with toothpaste, an activator liquid, whitening gel and a mouthguard. The mouthguard is mouldable, so you put it in boiling water, put it in your mouth and it shapes to your teeth. You use this kit for 10 minutes, twice a day, for two weeks. I already had pretty white teeth, but the kit has given them a bit of a lift. The kit promises 8 shades whiter, which I obviously haven't achieved, but if your teeth really were at no 9 on the chart (super brown), I wonder how well it would work. Because the system takes so long (2 whole weeks, twice a day!) I didn't notice the difference until I looked at the before and after photos. So the process is: clean your teeth gently, fill the trays with a little whitening gel, and then rub the accelerator liquid over your teeth. It's in a tube with a fabric top (a little like a bingo dobber). You then put the trays into your mouth before you close your lips and rub the accelerator off. You then leave it for 5-10 minutes, before you rinse your mouth and brush your teeth properly with the special toothpaste they give you. You don't know how much of the gel to put into the trays, therefore I ran out before the two weeks was up. I go about 12 days out of the kit. It turns out 5 minutes is a really long time in the morning, when you're running late. After a week I got a hang of how to fit it into my routine, but it wasn't easy and I did skip it once when I was so frustrated with how long the whole process took. Overall - I don't think I'd buy the kit again. Although it was a good price and did deliver results, there are more options out there, which take less time and are less faff. I will endeavour to keep trying kits and giving you full reviews!